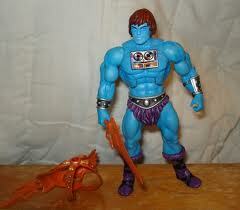 Faker was originally built by Man-At-Arms to cover for He-Man when Prince Adam is needed, Faker was abandoned after his first mission in the royal junk yard and salvaged by the evil warrior Tri-Klops. At the request of Skeletor, Faker was reprogrammed to replace He-Man and convince the people of Eternia that He-Man had betrayed King Randor and turned to evil. Faker's stats are for 13th Age from Fire Opal Media and published through Pelgrane Press. Preorder here! Natural Roll of 16+ The target is popped off from being engaged with Faker and takes an additional 1d10 damage. Immune to effects Faker is immune to all effects, even ongoing damage. Icons: Faker works for Skeletor (The Lich Lord). He is an enemy of King Randor (The Emperor).